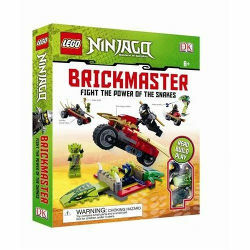 5002772 LEGO Ninjago: Fight the Powers of the Snakes Brickmaster is Ninjago Brickmaster book released on July 16, 2012. Build and battle in a LEGO® Ninjago Brickmaster adventure! The Masters of Spinjitzu are at it again – this time in an action-packed LEGO® Brickmaster adventure. Young aspiring ninjas can build their own Ninjago adventures with this Ninjago-themed installment of the Brickmaster series. This kit includes bricks, 2 minifigures and an exciting adventure comic book packed with building instructions. Build and battle as you read along! Collect the complete series for even more LEGO Brickmaster fun! In this book, Cole (ZX Variant) is on the 9441 Kai’s Blade Cycle instead of Kai. Lasha has a staff (without a symbol or sign). the four vehicles that you can build (one at a time) closely resemble the four Ninja vehicles. Even though Lasha is a Venomari tribe member, a translucent dark-purple Hypnobrai snake minion is included with him. Facts about "5002722 Brickmaster Ninjago: Fight the Power of the Snakes"